At that same time, Geo Milev—one of Bulgaria’s most beloved poets—started a politically charged literary magazine with Georgi Sheytanov, a notorious anarchist on the run. Eighteen months later, the government assassinated both of them, although Milev’s body wouldn’t be found for another thirty years. 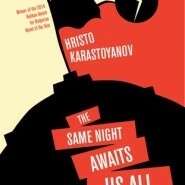 In this multilayered historical novel that calls to mind Laurent Binet’s HHhH, Hristo Karastoyanov deconstructs this period, blending this adventurous tale of resistance with current-day reflections on what this period meant to Bulgaria and the world.